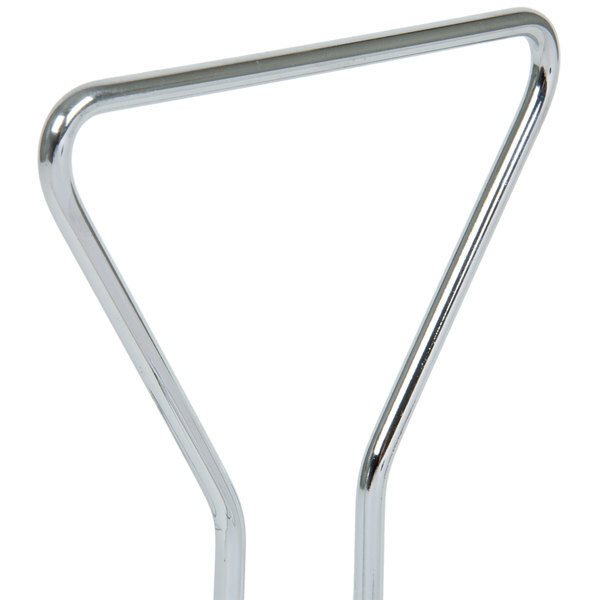 Provide the patrons at your restaurant, buffet, carnival stand, or banquet hall with easy access to the condiments they love with this holder! 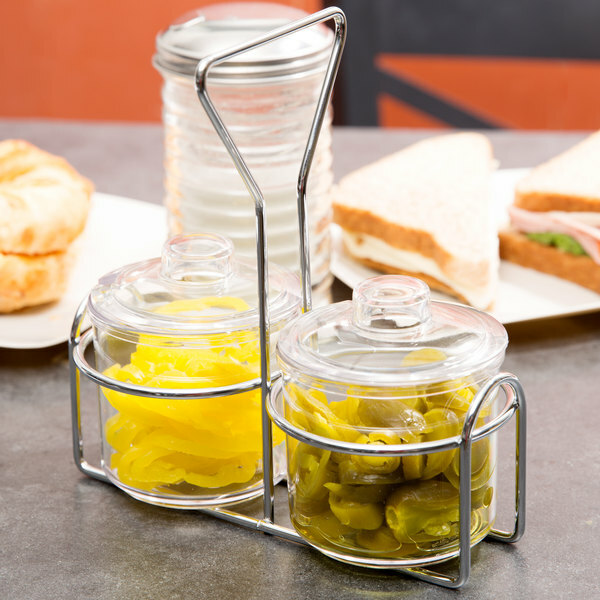 This holder is at home at both a condiment table at a burger stand to allow customers the chance to spice up their own fries, or on the table at an upscale restaurant serving gourmet salads and dressings. 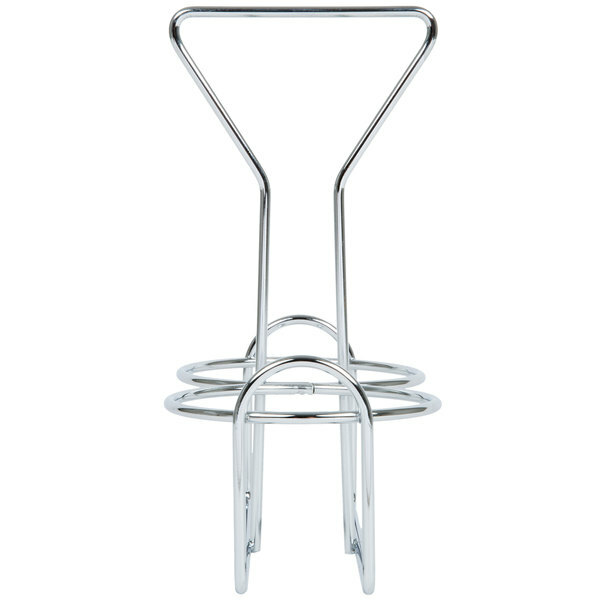 Each holder is made of durable chrome finished metal that will hold its shine for years of use. 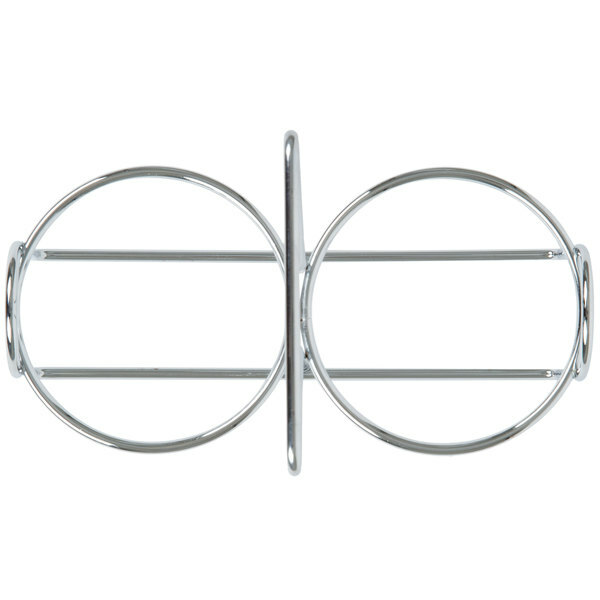 Additionally, your staff will appreciate that the large loop handle on the top makes this rack easy to move when bussing tables. The bottom frame bar supports the 6 oz. bottles (sold separately) when carrying the rack and also serves as feet to ensure this rack will sit securely on your table. Cal-Mil 3057 Chalkboard Label - 2" x 3"
this is a good quality wire condiment holder i use at my restaurant and it works so good the price is good and the quality too !! The 2 Hole Wite Condiment Holder is a great wire holder to hold my 7 oz. Plastic / Glass Condiment Jar with Lid!! Price point is great and can’t be beat! This condiment holder is surprisingly sturdy and feels far more expensive than it costs. Attractive way to display condiment bottles on your tables. Fits larger, circular bottles of sauce like Sriracha particularly well. Many restaurants and cafés offer multiple condiments. 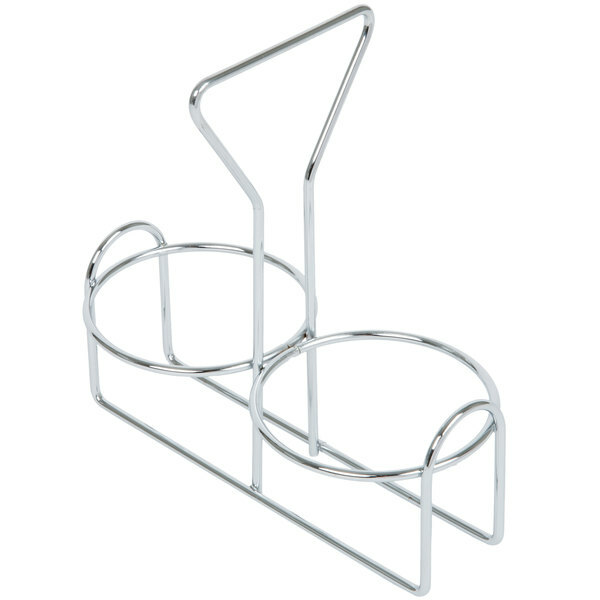 This product is a wire condiment holder and will hold two different types of condiments. 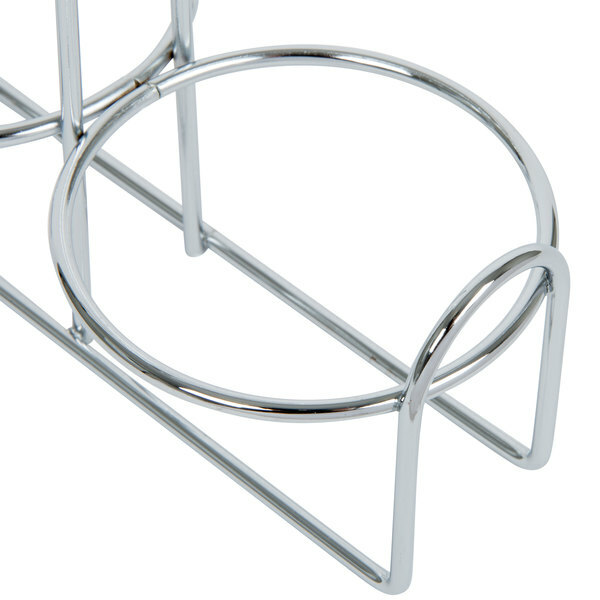 The top loop on the condiment holder makes it easy for your servers to carry throughout your restaurant. The condiment holder has a shiny finish. 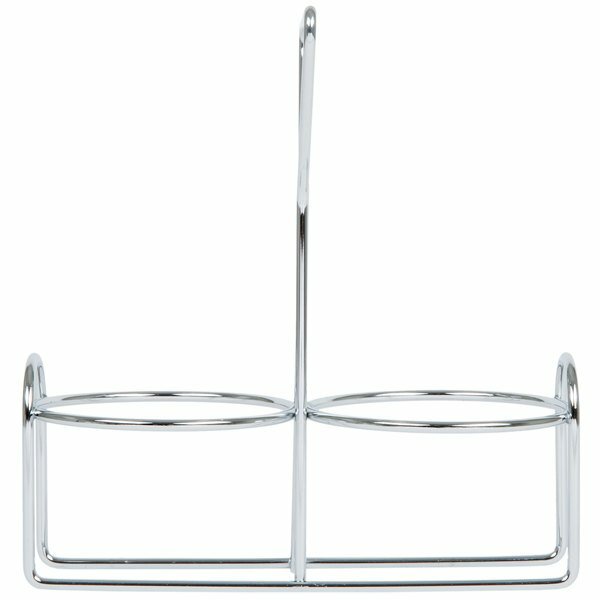 This two hole wire condiment holder is great for transporting and neatly presenting table condiments. The size is perfect for ketchup and mustard condiments on burger nights or parmesan cheese and red pepper flake condiments on pizza night. I would highly recommend and do hope to see five and six hole options available in the future. These cab hold condiment bottles, oil and vinegar bottles as well as other items. This is a well made product that is affordable enough to have on all of our tables. If you're a restaurant, these are cheap and surprisingly durable. Economical choice if you need a lot. For home cooks, these are useful if you have a large condiment collection. The holder does a good job at holding and keeping our vinegar / oil combo stationary. However, the only negative is the acidity in the vinegar has started to rust some of the wire holder. Overall, for the cost it is efficient. 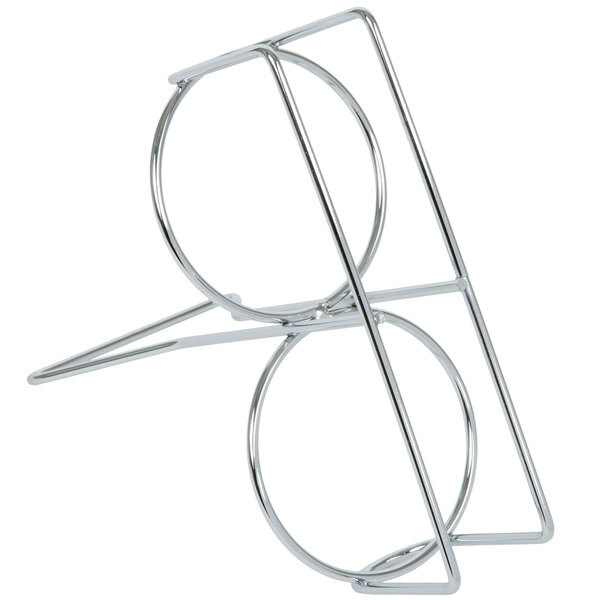 This 2 hold wire condiment holder is very sturdy and well made. We bought the oil and vinegar cruets to go in these. We use them not only for oil and vinegar but for other dressings and sauces. The holders are perfect for bringing the cruets to the tables. We are using these with the jar to hold our scoops and tongs for customers. Our customers love the ease of getting to the scoops and tongs. Easy to clean.